I get my fair share of visits from friends and family – and really enjoy seeing the city of Santander through their eyes. In fact, most of these blogposts are inspired by questions or observations from my out-of-towners. When one such visitor told me that I’d missed a great Kate O’Brien (1897-1974) Literary Weekend last month, I sought solace in my copy of her 1937 travel book ‘Farewell Spain’. Not only was it a great read again – I love the Irish writer’s fascination with Spain, “a land we care for uncritically”, but this journal of her time in Santander and the North of Spain in the mid-1930s struck me as an interesting way to present the city I never knew. So I’ve allowed her set of eyes and her words to document the city as she saw it in 1935. There are few in a position to criticise her viewpoint. (If you can, please get in touch.) For the rest of us, let’s enjoy her thoughts on travel, on Santander, and on life. Let me quickly give you some context to the book. It’s a “plaiting together” of a number of trips taken by the writer during the mid-1930s. From her home in London, she weaves these trips into one, based on her recollections rather than diaries. Her decision to write a book of this nature at this time shows her as an independent-minded and gutsy individual – which indeed she was. The title of the publication and the premise of this book as a whole is to say farewell to democratic Spain. Although it could be interpreted as latching on to a cause to get herself some exposure, and this cause was certainly a concern in literary circles at the time – when you read the book you realise that her adoration for Spain and her outrage at the Civil War is the only motivation. Although it was written 77 years ago, as you read her words, you sense her fear for the direction the Civil War is taking. But let’s talk about the travelling first before we get to choked up in the history. 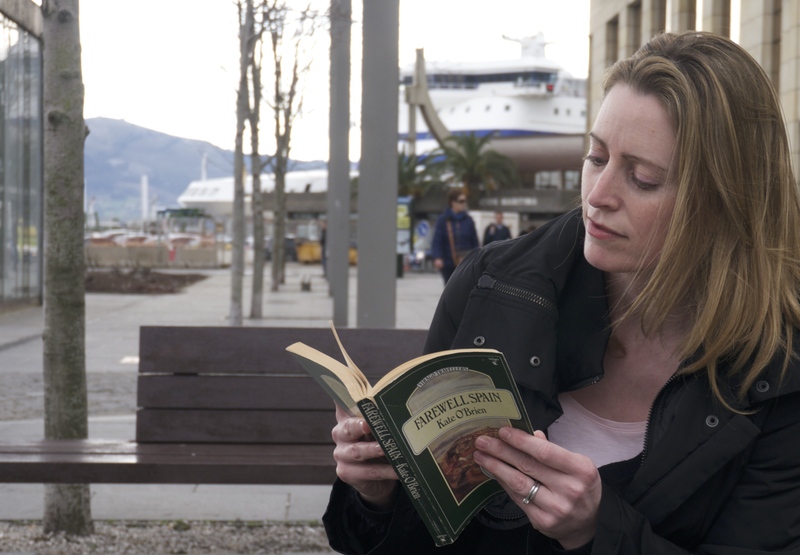 Before we even step off the ferry at Santander, Kate O’Brien has declared herself to be an escapist and a sentimental traveller. No, she’s not looking for pretty sunsets. I take it to mean that she looks to connect with others emotionally while abroad. She describes how a traveller’s enemy is his or her pre-conception of where they are travelling and says that these preconceived ideas of a place must be dismantled if they have any chance of getting to know a country. To do this, she says, you need time (ideally more than a fortnight), some Spanish, you must be “well prepared in advance with real information” and have “no obstinate pre-conception of Spain”. I have to say I agree with all of this. By way of example, she praises her fellow countrymen Harry and his wife from Dublin with whom she coincided on her stay in Santander. Harry “got on well with the Spaniards, and it was pleasant to see how far in gay understanding that man could go with the five or six words he bothered to learn.” She was rather proud of this couple’s initiative – going to the Casino, Pedrosa, Solares, learning to drink wine from a ‘porron’ by men in overalls and going to a ‘romeria’ in a village in the mountains. (I’m quite impressed myself to tell the truth!) Kate O’Brien went with them to their and her first bullfight. Harry, for those of you why might be interested, didn’t like it – his wife was enthralled. Kate O’Brien was “interested and perplexed”. 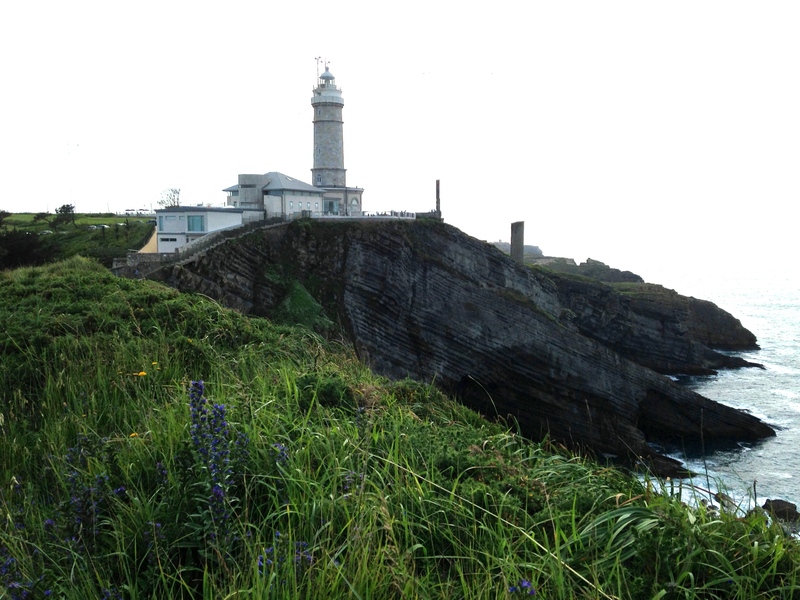 As I do when anybody asks me about visiting Santander, Kate O’Brien begins by preparing the reader for the Northern climate – comparing it to Devon and Kerry. In Santander, she says in her intro, it’s “very likely to be raining cats and dogs“. Now, as any member of my family will tell you – it doesn’t rain that much. I was strangely relieved when I turned a few pages and found the weather was thankfully “fine and hot“. But I’m certainly with her in believing that it’s better to undersell Santander’s climate – just in case it is raining when a person arrives. If I ask myself whether Kate O’Brien liked the city, I would have to say ‘yes’ but I think she was confounded by it. I think she was cautious about recommending it because in addition to the climate (or because of it) the city was (and still is) quite different to most people’s image of Spain – and therefore requires an extra helping of that on which she spoke above – an open mind. It’s true that her description of the city as “a plain-faced, sober town of decent importance and integrity” does seem very cold. She warms slightly in her description by adding “its landscape is green, fertile and homely-seeming”. You’ll have to decide whether you agree with her descriptions by looking at the images from the 1930s. I suppose there’s a lot worse than being plain-faced and homely-seeming. Maybe it’s a little optimistic on my part but I like to think that she is concerned about those who may choose to holiday in Santander, feeling more at ease and a lot less responsible when her fellow travellers go to Potes, Burgos, Altamira or San Vicente de la Barquera. She is uneasy about recommending this place. 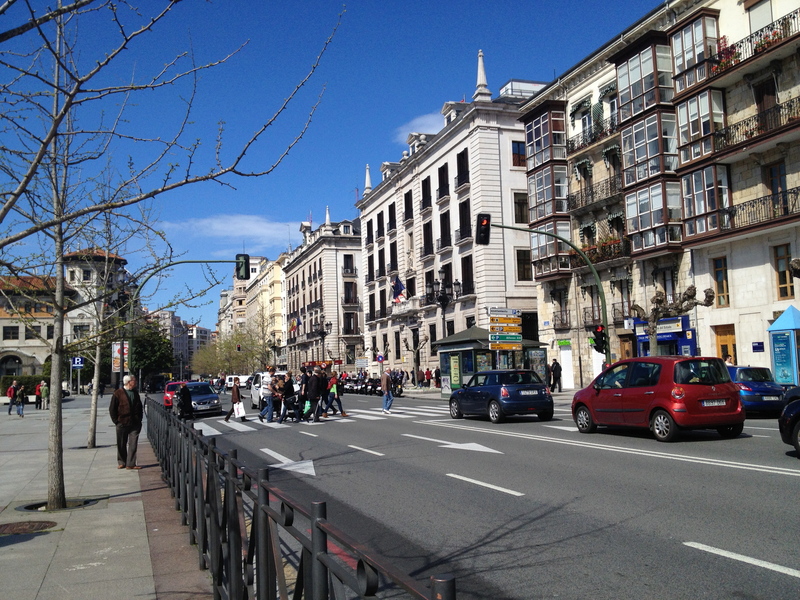 If she is a little unsure about the city, she is more decisive about the residents of Santander. “The people, bred between mountains and shore, have largely the sanity such breeding gives, and its courage. They speak good Castillian, they are courteous, humorous and kind; and they and their regime are muy español, they would say.” I can’t fault any of that. She allows these observational skills to illustrate the political minefield in which she finds herself. Her description of a conversation between an anarchist and a journalist at the lighthouse paints a helpful picture – without her having to sound-off on politics or history. Incidentally, I think this conversation really rattled her because she gives no mention of the views from the top of Cabo Mayor – which must have been staggeringly beautiful. And in between the clumsiness of the travellers and the conflict between the residents, there are some lovely light touches – for example – she refers to Consuelo at her hotel, as “the most beautiful chambermaid who ever held a duster“. And her descriptions of the waiters and porters throughout the book are very tender. Kate O’Brien might be able to tolerate a local preference for a hair-style amongst the residents but is much less sympathetic of the traveller that might choose a hotel in the fashionable seaside suburbs of the Sardinero. 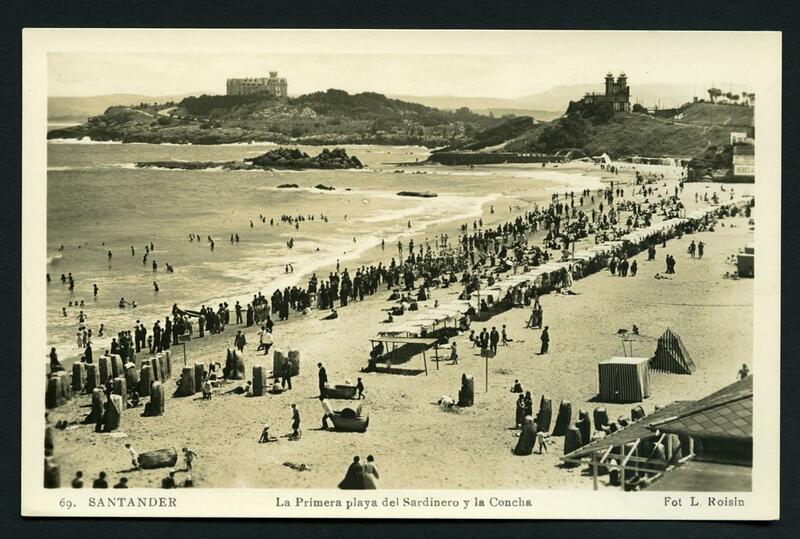 This area, “discovered by Alfonso XIII some years ago” was still in “summer-holiday vogue” in the mid-1930s. I don’t think she liked either the Anglo-influx to the city, thanks to Alfonso’s wife, the English Reina Victoria, or the affectations acquired locally as a result of the royal family’s presence. She seems to sneer at both when writing about one of her fellow-travellers who is wearing plus-fours which “will please the local señoritos, who have a fancy at present for that unfortunate kind of trouser.” One hundred years on, there is still a bit of an Anglo-look in the shops and on the streets but I’m not sure whether that dates back to this period or not. I must do some reading around this subject. 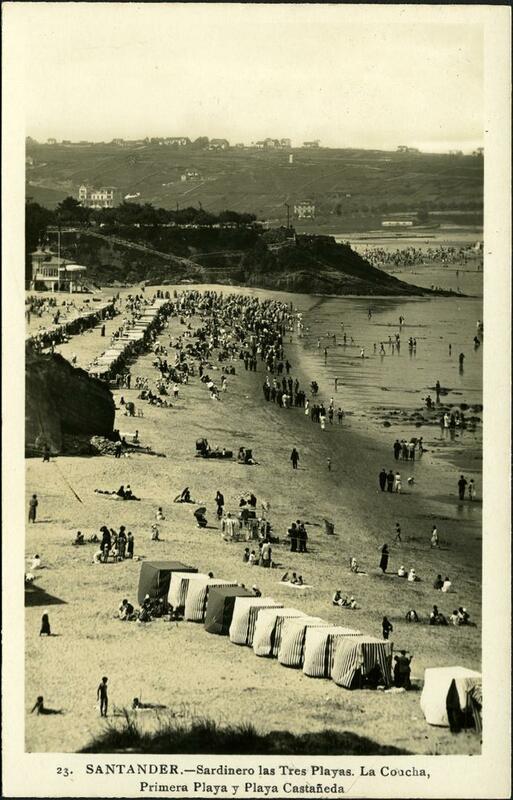 She did stay in town long enough to see the ‘season’ in full swing and praises her theatre experience in Santander. The city plays host to the country’s top companies that re-locate north “when Madrid grows too hot to be profitable to the players“. She has less praise for the ‘zarzuelas’ or musical comedies that also decamped. Her attendance at a bullfight tells me that she was here for the Feria de Santiago in the highest of the high season. By the end of the chapter on Santander – which I’ve just realised she called Peevishness (meaning cross, irritated or obstinate), she loses her patience with the city, calls it “unexceptional” and complains about “that confounded bandstand. There’s no denying that Spaniards are wolves for noise.” I think she is bored with the ‘season’ and keen to get on her way. From Santander she goes to Santillana, La Montaña’s “lost jewel” and she stops in Altamira also. And then she goes on – to Covadonga, Coruña, Santiago de Compostela, Salamanca, Avila, Madrid, El Escorial, Segovia, Burgos and Bilbao. She finishes her journey with us in this book in Irun, on the border with France. As you would expect, the writer did not have any friends within the new regime and two decades passed without her setting foot on Spanish soil. Of course, Kate O’Brien was no stranger to censorship. The Irish Censorship Board had already banned her 1936 novel ‘Mary Lavelle’ and would later ban her 1941 novel ‘The Land of Spices’ for immorality – a classification that wasn’t infrequently applied to domestic and international literature in the 1930s, 1940s and 1950s in Ireland. Kate O’Brien did return to Spain from 1957 onwards for a number of occasions but died in 1974 before Franco’s passing and the subsequent transition to democracy. My copy of ‘Farewell Spain’ includes a touching introduction by the writer’s friend Mary O’Neill dated 1984 in which she reproduces an article by Kate O’Brien. It had been published in the Irish Times in 1969 and welcomed the idea of a return to monarchy in Spain. As usual Kate O’Brien didn’t mince her words: “any bit of a King, however expensive, is infinitely less of a mischief than a non-stop dictator“. If you are interested in the censorship of Kate O’Brien’s work in both Spain and Ireland, I came across an in-depth article by Marisol Morales Ladron published in 2010 which is an interesting read. You should also read the article from the Limerick Leader ‘Self Censorship is the New Battle‘ by Man Booker Prize winner, Irish writer Anne Enright at this year’s Festival. As I walk about the city centre in 2014, I ask myself what Kate O’Brien would say about Santander now. So much has changed since 1936. A decent section of the mediaeval city was wiped out by the fire in 1941 for starters. 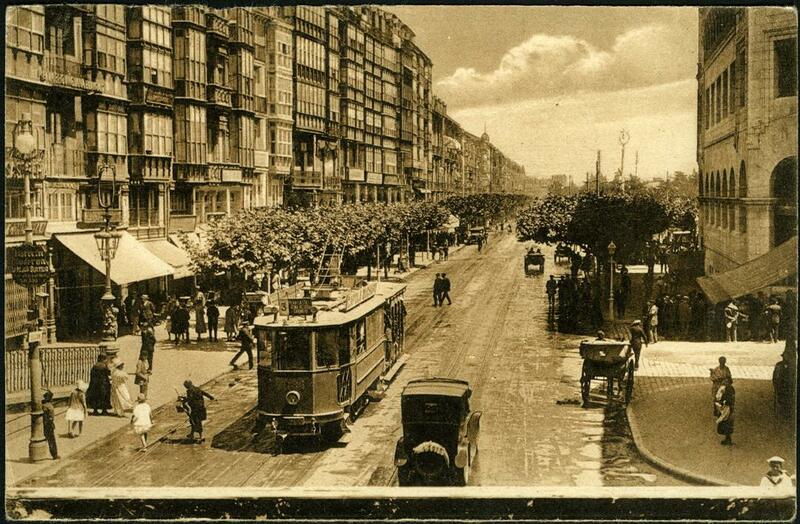 And the tramlines were taken up by 1953. The ‘new’ cinema is gone too. And considering the population has doubled if not tripled since then, the human footprint has left its mark by way of apartment blocks, roads, shops, offices and the streets are full of cars. And you won’t find many fishermen at the wharf in front of Paseo de Pereda – they’ve been moved to a new dock. The city isn’t completely unrecognisable though. Some of the tall miradored houses she wrote about are still here. 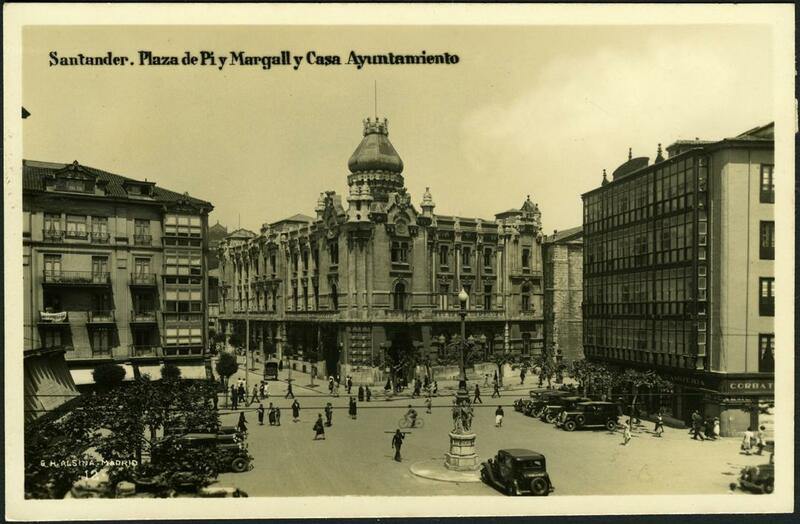 And the lighthouse, the casino, the bullring, and the monuments to writers Concha Espina and Pereda – they’re all still here. The beaches are too (although the recent storms have battered the coastline). Alfonso XIII’s palace is still overlooking the bay – it’s open to the public now – the present royal family holiday in Mallorca. And the shrimps – which “are almost de rigueur with aperitifs” – are still in demand in practically every bar and restaurant in the city. Alfonso XIII’s palace is still the first landmark when you arrive by boat as Kate O’Brien did. Curiously the ‘season’ still exists although the Ryanair flights are bringing in more year-round traffic. The season no longer commands any royal patronage but the four weeks of July and the first two in August are still when the place really comes to life. 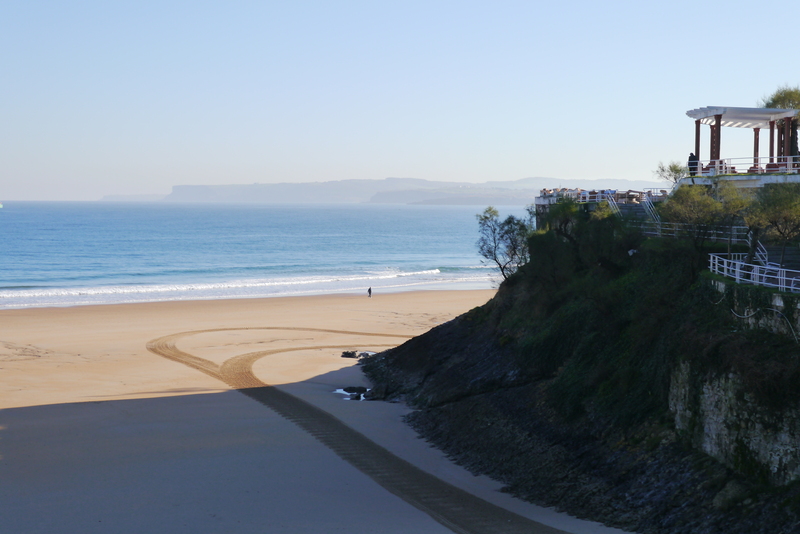 That’s when the Madrileños come to the coast and the restaurants, bars and beaches are full to capacity. The festival hall is bursting with performances, the bullring is busy, there are queues to get into the carparks and the streets are thronged. It’s both exciting and annoying for the year-round residents – who I suppose you could describe as being a little peevish when it gets to the middle of August. I’ll forgive her for the ‘peevish’ title then, I suppose. Want To Read or See More? 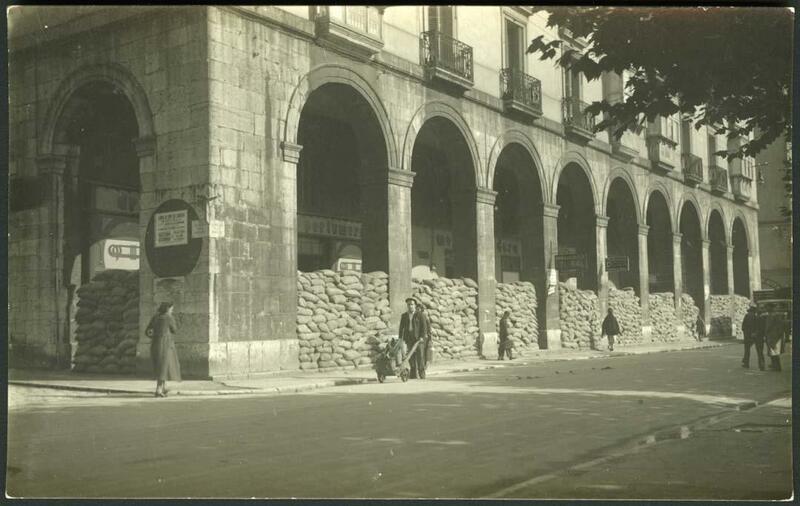 I have to praise the great work at CDIS – the Centre for Image Documentation in Santander. It is brimming with great images and friendly helpful staff. 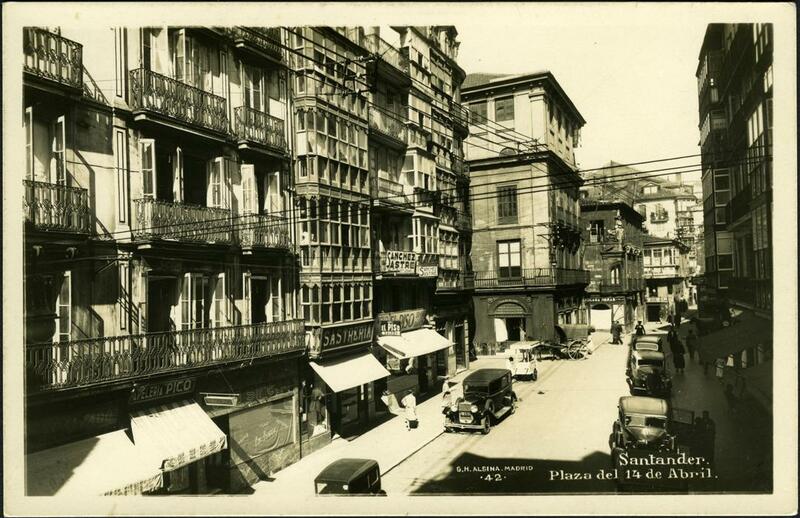 They have been encharged with the work from some of the great photographers of the period – so if you are looking for some interesting old shots of the city, you can pick images such as the ones here for a couple of euro. Browsing their archive is a fantastic way to learn about the history of the city. I expect to be a frequent visitor. If you’d like to learn more about Kate O’Brien, go to the festival website or check out the shelves at O’Mahony’s bookstore in Limerick which stocks the writer’s work and that of the speakers at this year’s event. 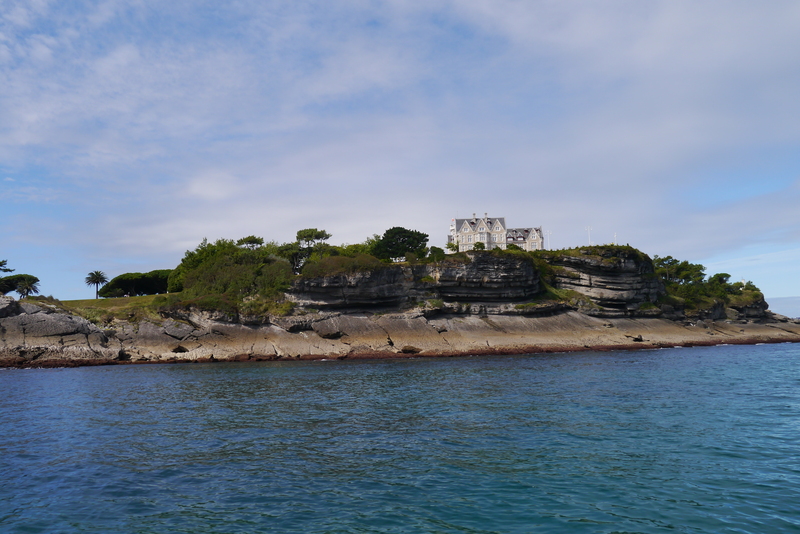 I’m interested in learning more about the years the royal family holidayed in Santander and the family’s influence on the city so I’ll do a bit of reading up about that and bring you the fruits of that here sometime. But more immediately, I’m going to order a few more books by Kate O’Brien. And I fancy taking some inspiration from ‘Farewell Spain’ and going over to Santillana – the lost jewel – perhaps with my next set of out-of-towners. For now though – it’s a farewell from me. 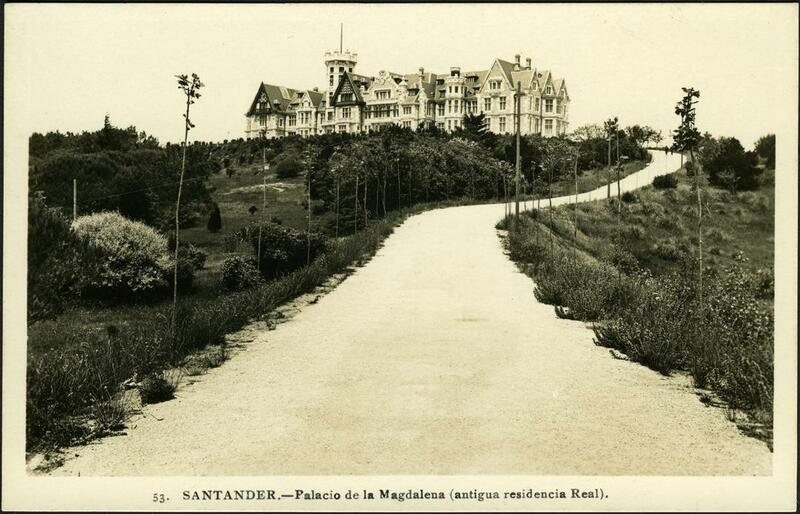 I thoroughly enjoyed the old photographs and I understand why Kate O’Brien was ambiguous about Santander. Her attitude to Franco may have been coloured by her first stay in Spain which she spent with a Basque family as a governess/tutor. This is my favourite post til now, congratulations! I´m sure that it took you a lot of time. Thank you very much Pamela, I´ve been taking these photos for years, and much more are coming. I moved my old blog to a new site, made some changes… btw I´ve linked your blog in mine, I love knowing how we, the santanderinos, are seen by foreigners and I like sharing your perspective about us. Pamela, You paint a lovely picture of Spain both through Kate O’Brien’s eyes and your own. I adore ‘bred between the mountains and shore’. It reminds me of the inbreeding that happened(s) in Tasmania! Have just listened to an audio book whilst gardening called ‘Golden Earrings’, written by Belinda Alexandra. It is set partially in Spain. The story is a bit disjointed: set first off in Paris amongst the Spanish ’emigre´ community, and then re-lives why the grandmother left Spain. (Skipping backwards and forewards…) Loved your photos! I shall share your post with some other bloggers! Thanks Barbara. I have to admit that I thought Kate O’Brien was referring to in-breeding when I first read that line about the sea and the mountains too. But on re-reading it, and because she doesn’t refer to it again, either directly or indirectly, I think she must have meant it positively – as in ‘how wonderful it was to have both mountains and coastline’. It is so nice to see my town through the eyes of a foreigner. Your documentation efforts are amazing, I am learning a lot learning your posts. Greetings from a Santanderino that lives far, far away from ‘la Tierruca’. Thanks so much for such kinds words. It’s surprising and lovely to know that quite a few of my readers are Santanderinos. I’m really enjoying learning about your home city – peeling back the layers is great fun. Thanks for commenting and all the best to you wherever you are! 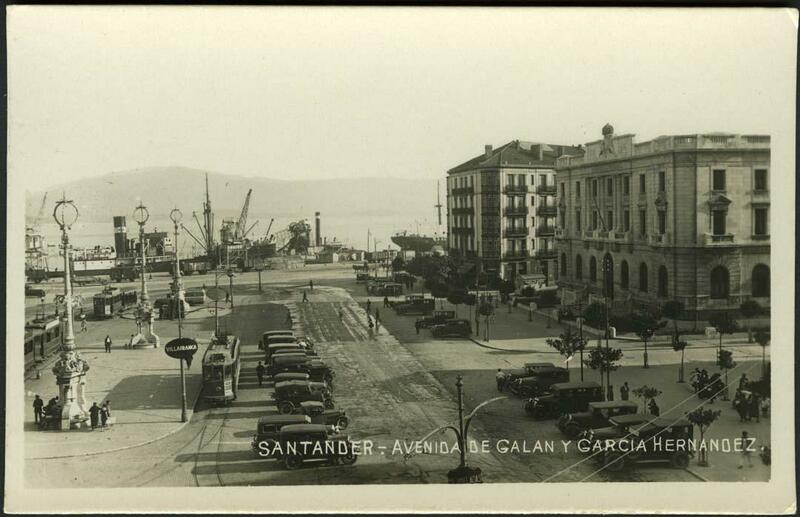 I look forward to more posts and learn new things about Santander. Reading your blog helps to fight homesickness when you are in a place so far and so different from there like in my case. Cheers!